We’ll provide some insights and review some of our value DFS defense picks for week 12. *The DraftKings (DK) full-slate does not include the two early games on Thursday but those are included on FanDuel, so players from the Chicago Bears, Detroit Lions, Dallas Cowboys, and Washington Redskins are excluded. Week 12 byes (Final week of byes) – Kansas City Chiefs, Los Angeles Rams. San Francisco 49ers – Salaries: DraftKings (DK) – 2300, FanDuel (FD) – 3500. The 49ers’ salary ranks them 15th/16th on DK/FD, respectively. The betting line with the Bucs has the game total at 55 points (2nd highest on the board) with the 49ers as +3.5 point road dogs. The Bucs’ implied team total is currently at 29.25 points and the 49ers are currently at 25.75 points. The 49ers are coming off their bye. The Bucs rank 30th in fantasy points allowed to opposing defenses, give up the 28th most yards with 395.9/gm, and allow the most points with 32.9/gm. The Bucs also toss the most interceptions with 23, which is 7 more than the next worse team. The Bucs give up the 15th (tied) most sacks with 27. Last week, the Giants’ defense logged 1 sack, 4 picks with one returned for a TD, and allowed 35 points for 11 fantasy points, ranking them 6th (tied). The 49ers’ defense ranks 28th in fantasy points scoring, 18th (tied) in sacks with 25, and last in takeaways with 5. The 49ers also give up the 10th fewest yards with 344.2/gm, and allow the 6th most points with 26.6/gm. The matchup here boils down to targeting Tampa Bay, which gives up 2.9 turnovers per game. The 49ers, though not a good defense in any metric, do have a decent chance to score points if punting the position this week. 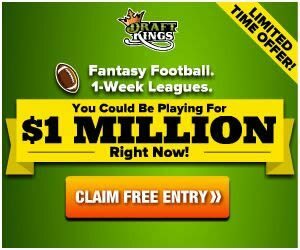 Buffalo Bills – Salaries: DraftKings (DK) – 2700, FanDuel (FD) – 4000. The Bills’ salary ranks them 9th/10th on DK/FD, respectively. The betting line with the Jaguars has the game total at 37.5 points (lowest on the board) with the Bills as +3 point home dogs. The Jaguars’ implied team total is currently at 25.25 points and the Bills are currently at 22.25 points. The Bills are coming off their bye. The Jaguars rank 26th in fantasy points allowed to opposing defenses while the Bills’ defense ranks 18th in fantasy points/gm. The Jaguars allow the 13th (tied) most sacks with 28 and the Bills rank 18st (tied) in sacks with 25. The Jags also cough up the 5th (tied) most turnovers with 20 while the Bills rank 12th (tied) in takeaways with 15. The Jags rank 21st in yards with 347.8/gm and 29th in points scored with 17.6/gm. The Steelers’ defense logged 6 sacks, a fumble recovery, and allowed 16 points to the Jags for 9 fantasy points last week. Indianapolis Colts – Salaries: DraftKings (DK) – 2900, FanDuel (FD) – 4400. The Colts’ salary ranks them 7th/7th on DK/FD, respectively. The betting line with the Dolphins has the game total at 51 points with the Colts as -9 point home favorites. The Dolphins’ implied team total is currently at 21 points and the Colts are currently at 30 points. The Dolphins are coming off their bye. The Dolphins’ offense gives up the 9th most fantasy points to opposing defenses and the 9th (tied) most turnovers with 15. This offense also ranks 28th in yards with 313.6/gm and 26th in points with 19.9/gm. Green Bay racked up 6 sacks, a pick, a fumble recovery, and held the Dolphins to 12 points in week 10. The Colts’ defense ranks 16th in fantasy points per game and 5th (tied) in turnovers created with 19. The Colts’ defense logged 5 sacks, 2 picks, and held the Titans to 10 points for 13 fantasy points, ranking them 4th last week. Ryan Tannehill (shoulder) has been named the starter, but is still less than 100%. Tannehill hasn’t played since week 5. With the Colts as big home favorites, Tannehill should have to shoulder the load for the Fins, giving the Colts multiple pathways to score in this solid matchup.